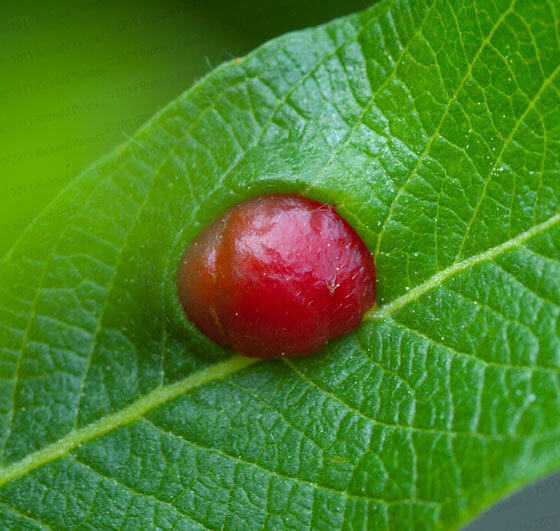 I have included three photos of this gall, first the top of the leaf, 2nd the underside of the leaf, and third a context shot to show what kind of plant I found this gall on. I do not know what the plant is, but I've seen it often. I am told it is some kind of twin-berry, but I have my doubts. As to what created the gall, I haven't a clue. All I can tell you is that the plant is growing in a protected wetland zone. This is a Pontania sawfly gall on some kind of willow. maybe Scouler's Willow (S. scouleriana)?